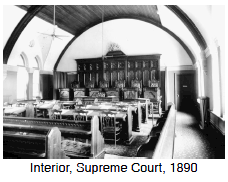 Canada established its own Supreme Court in 1875. Before that, Canadians seeking a high court decision on something had to go to London, England to be heard. One important function of a Canadian Supreme Court was to interpret the division of powers between the federal: having to do with the central, national government. For a definition of a federal system of government see "federal union. "federal and the provincial governments. The British North America Act had outlined the basic areas of responsibility of both levels of government, but the kind of federation that was established by the BNA Act required that we have some kind of independent body to judge between competing claims. Quebec had rejected the idea of a Supreme Court when John A. Macdonald first suggested it in 1869 because they felt it would infringe on provincial rights. 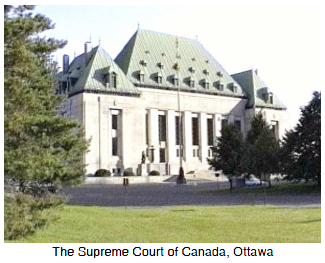 When the Supreme Court was originally set up it had six members - two from Ontario, two from Quebec, and one each from New Brunswick and Nova Scotia. In 1949 the Court was increased to nine members, with one-third coming from Quebec and therefore familiar with their Civil Code - a different system of civil law: law that deals with private rights (property and the individual), as opposed to "criminal" law which involves crimes against the community. French civil law is written down, or statute law, as opposed to common law.civil law than the rest of Canada. The Supreme Court wasn't the last court of appeal, however, until 1949. Until then, Canadians who disagreed with Supreme Court decisions could take their appeal to the Judicial Committee of the Privy Council in Britain, as happened in the Persons Case.